Alton joined eQuality-Pathways to Potential in the Summer of 2005, almost 12 years ago. After 2 years working at various job sites, Alton interviewed for a position at the brand-new Trader Joes that was opening in Maple Grove. Alton is one of the original crew members at the Maple Grove location and has been there now for 10 years, what an amazing accomplishment for Alton. We often find ourselves looking at the success of our associates to find what truly makes them the successful employee that they are. In Alton’s case his success is a result of his incredible work ethic and the supportive work environment that Trader Joe’s provides. Trader Joe’s is a naturally supportive work environment where there is a strong emphasis on team work and open communication. The energy with the crew is inviting and high energy but also laid back which helps put Alton at ease and to quickly find his place with the crew. It was the perfect fit for Alton. Since starting at Trader Joe’s 10 years ago it’s been noted that he has really “come out of his shell.” Alton has an amazing smile he shares with the customers and crew at Trader Joe’s; regular customers come in weekly expecting to see Alton’s smiling face and receive a warm greeting. Alton knows Trader Joe’s like the back of his hand and is fluent in completing almost every task. Alton’s Supervisors at Trader Joe’s support Alton in learning new tasks and taking on new responsibilities. They are open and communicate with Alton and his eQuality staff to ensure all needs are being met and that Alton is happy and challenged with the work he does at Trader Joe’s. 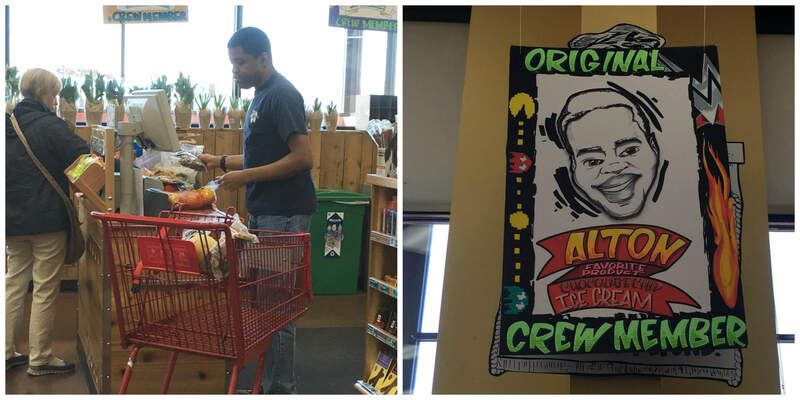 Alton is a valued member of the crew and the Maple Grove Trader Joe’s would not be the same without him! Congratulations Alton on 10 years with Trader Joes!